I have been going by the house for years now, every time I am home for a visit. It was just a shell of where we lived but I felt compelled to visit every time I was back in New Orleans in the years following Katrina. A few months ago, my mom sent me an email to tell me that the house had been razed. It’s just river sand now, she wrote. She said she picked up three pieces of brick (one for her, one for my dad, one for me), a small piece of wood, a small piece of latticework—the traces that were left behind. She said she wanted to lie in the sand and make a sand angel, to place her body on the earth itself, but a truck drove up so she just pretended. I knew, then, what to expect when I went by 3324 Vincennes Place, and yet, I was surprised all the same. I was taken aback by the shock of green grass usurping the plot. I had expected river sand, but since my mom visited, there had been time for old seeds to sprout up. To fill this hole, this gap, this absent space. I thought: how odd to witness so clearly an absent place that is so full, this place that occupies so much space in my in my memory. The lot looks enormous without our house on it (hadn’t my mom mentioned that in her email as well?). Just one small block of green. It was hard to imagine all those rooms, all that our house contained. I pulled out my journal and tore out a perforated page. On it I wrote: THIS WAS HOME. This (space). Was (past tense of “to be,” as in is no longer). Home (a place where families are born, where dreams are dreamed, where mornings break and evenings are put to bed). 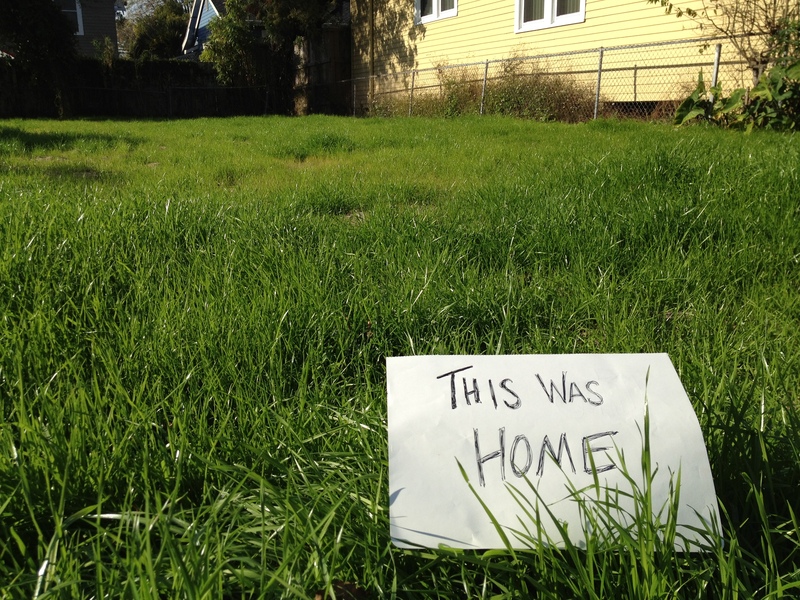 I took pictures of the sign resting in the grass in front of the plot. 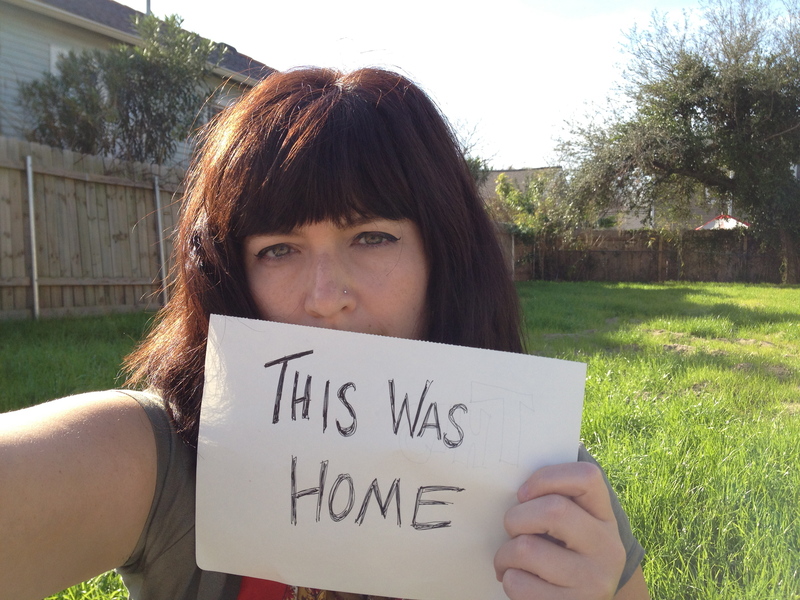 I took portraits of myself with my arm extended, holding the sign. I walked around the perimeter and traced the word HOME with my finger in the river sand. Then I took a stray stick and signed my name in the corner of the plot before tucking the stick in the back pocket of my jeans. Three trees stood as sentries at the back of the land and then there was just the span of grass and sand and the neighboring fences on either side. 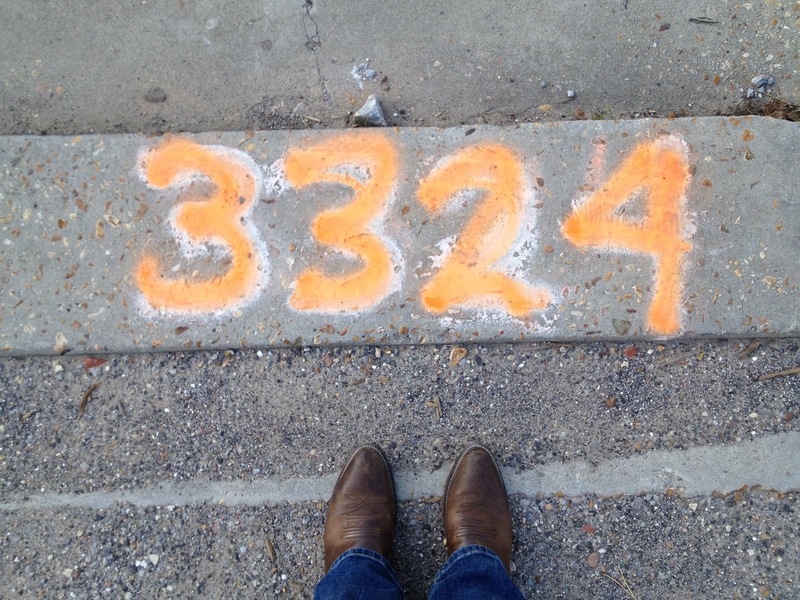 The sidewalk had 3324 spray-painted in orange, over a version painted in white. This now marks the address since there is no longer a house to mark the space. Addresses are random numbers and letters we assign to places to make them ours, to make them home, to tell people where to find us. While I was sitting in the car across from the plot where our house was, a mail carrier, mail in one hand and a bag crossing her body, walked by the empty lot on her route. I scanned my body. I felt tears behind the lids of my eyes—held, not held back. There was a sort of soft gnawing in my belly. I didn’t feel sad really but rather vaguely numbed out. This was a place I had been saying goodbye to for years. A place I came to visit as one does a deceased family member in a cemetery, over and over again. Our home died to us and now the traces of it, save a long thin piece of wood with blue paint that I found and took, are gone as well. And although this moment felt like it should be the natural point of closure, the final goodbye, I couldn’t imagine stopping my visits: even if there was a new house there, even if there was a new family in it. In the movie version of my life, we might end here as the protagonist bids farewell to her childhood memories and her childhood home and steps off into her very bright future. Maybe there would even be a flash-forward to her home-to-be, complete with husband in the doorframe and children eating breakfast at the kitchen table. So why do I feel its not over for me and this land? It’s not a compulsion, this desire to visit. It’s more like coming to sit in silence with an old friend. There’s a kind of peace that comes from being there—from remembering what was and seeing what is real now. I can sit with all the fond memories and the painful loss of this place. It feels real. It feels authentic—this mix of beauty and joy with grief and sorrow. This house taught me how to live life and bear it all: how to grow, how to be nurtured and to nurture, how to love and also how to unexpectedly and without warning, let it all go. To say goodbye. To unhand expectations of what the space you rest your life in looks like. I feel I owe this land so much—the place I was born into, where I took my first steps and read and wrote my first words, where I learned how to embrace and be enclosed in the arms of somebody who loved me. I learned to cry, to mourn and to go on, still and always, with the movement of life. I learned about the richness that lies in details—in the shape of a sill, in nicks, slants, the flaws we perceive as such or the ones we find charming. I learned how to observe and how to write those observations down. It occurred to me as I sat across the street from my childhood home that while I thought I had been coming back to grieve and let go, I was also coming back to honor and pay tribute to the home that held the space for me to become who I am, to the sacred spot where my mom, dad and I became a family. I realized I have continued to come back, all these months, all these years later, because I am so deeply grateful. 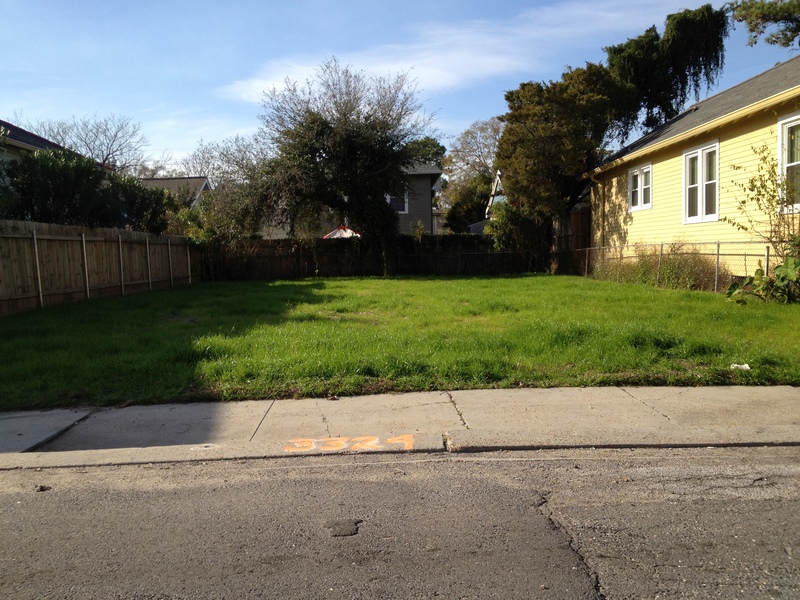 I closed my eyes and pictured the house that once stood on this plot of ground. What wonderful memories it brought back. You bring it back to life with your words. I loved “Woman’s Work”! It is a true depiction of your grandmother. My thoughts, over the years, were very much like yours. You are wise beyond your years. I thought I responded to this, but I guess I didn’t. Thanks, Nanny. Love you.